Microsoft has opened up its So.cl social networking service to the general public. The website is designed to let users share and comment on interesting search results and connect with "like-minded" people. It is targeted at students and had formerly been restricted to invitees at universities and schools in the US. Microsoft noted that the product was developed by its Fuse Labs unit as a "research project... focused on the future of social experiences and learning." 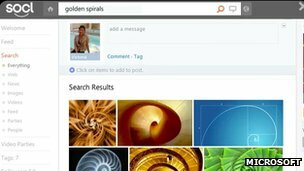 Members are invited to create "collages of content" using the firm's Bing search engine technology and external links which they can then share with others. 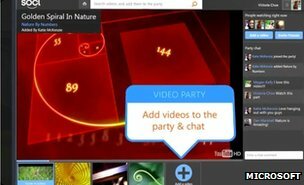 Users can then identify people who are interested in the same topics, monitor their associates' feeds and take part in "video parties" during which members watch online videos together, commenting on them via a chat function. Members can sign in using their Facebook log-in details, but their So.cl activities do not show up on Facebook's pages unless the option is activated. The move to open up the service was taken over the weekend with little fanfare, prompting some analysts to speculate that Microsoft only had limited ambitions for the project. "The fact that So.cl is targeted at students echoes Facebook's beginnings and has made many assume it is a Facebook clone," said Eden Zoller, principal analyst at technology consultants Ovum. "Microsoft is being sensible in positioning So.cl in this way - the opposite approach of Google, which entered social networking all guns blazing with a full on service, and is having modest success." Mr Zoller added that the project could also help Microsoft further improve Bing's search capabilities. A study by Comscore suggested that Microsoft had a 15.4% share of the US search market in April compared with Google's 66.5% lead. Earlier surveys have suggested the gap is even wider in the UK and parts of Europe. Earlier this month, Microsoft announced another tie-up with Facebook to integrate tips from the social network into Bing's results. Users in the US are shown a new sidebar which identifies "friends" who can help answer queries based on topics they had "liked" or posted photos about. Google has also shown interest in being able to use Facebook to improve its search results but has criticised the fact that the site has refused to sign a data-sharing agreement. In a recent interview on the US network PBS, Google's chief executive Larry Page described the situation as "unfortunate" adding that "in general , I think we'd like to see content on the internet being made more open".